Heavy metals toxicity is one of the leading causes of neurotoxic illness and it causes a decrease in overall wellness. Heavy metals are ever present in our modern environment due to the increased levels of pollution and chemicals. Modern technology, industrial pollution, and consumer goods are the route of exposure for most people. This is why toxic metal testing is essential to good health. It’s impossible to completely avoid toxic metal exposures. Many people have occupations that expose them to high levels of metals, while others are exposed through air and water pollution. But it is possible to reduce your exposure through better lifestyle choices. Typically, our bodies can handle small dosages of these metals. When the liver, kidneys, and gut are functioning optimally, they can eliminate most of these poisons. But the long-term chronic exposure that most of us face leave our bodies unequipped to handle the onslaught. Chronic elevated exposure over-time wears out these detox pathways and causes metal retention. High levels of toxic metals in body tissues (i.e. the brain), may cause significant neurological and developmental damage. Acute metal poisoning is rare. More common, however, is a chronic, low-level exposure to toxic metals that can result in significant retention in the body that can be associated with a vast array of adverse health effects and chronic disease. Occupational hazards for heavy metal toxicity include construction work, dentistry, painting, automobile repair, etc. Those who live in older homes have lead or copper leached into their water from the old water pipes (lead paint is an older risk but still present in some homes). Even city tap water contains a variety of different toxic meals. 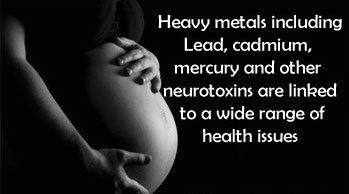 You may have been exposed to heavy metals in your mother's womb. Mom's are the number one source of lead exposure, as it passes to the child while in the womb and through breast milk. This is also true for mercury. 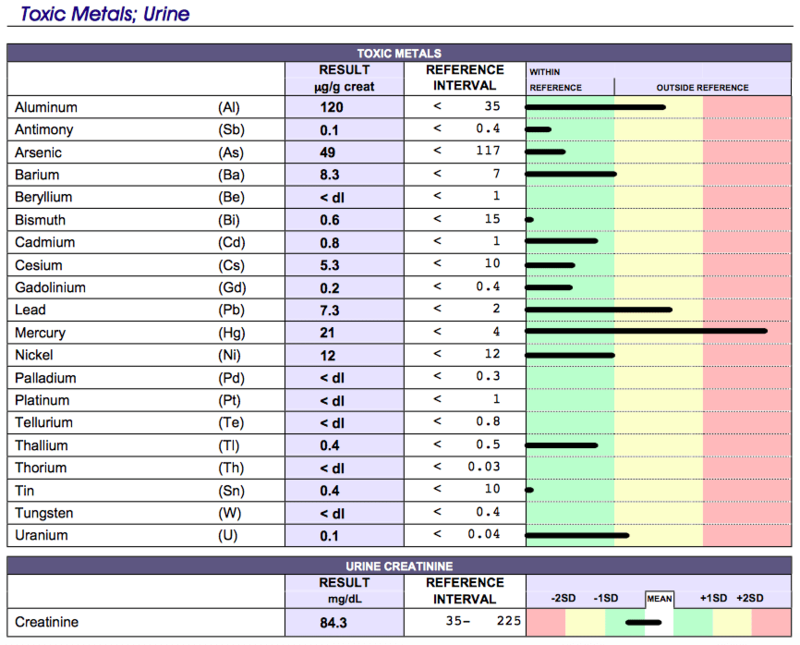 When the mothers test positive for heavy metal toxicity, the children also show the same high levels of heavy metals. What's in the mom is in the baby! Air pollution, contaminated fish, vaccines, and mercury amalgam fillings are also sources of exposure. Beyond the exposure to these metals, those most at risk are those with pre-existing health challenges. This includes micronutrient deficiencies, leaky gut, liver damage, blood sugar imbalances, elevated stress, and chronic infection. These issues can both contribute to heavy metal toxicity (by the body’s inability to properly detox) or be caused by the damaging effects of heavy metal toxicity. There are many different methods used when it comes to toxic metal testing, including hair, blood, and urine. Analysis of the levels of toxic metals in urine after the administration of a metal detoxification agent is an objective way to evaluate the accumulation of toxic metals. Toxicity occurs when net retention exceeds physiological tolerance. The best way to evaluate net retention is with a provoked urine challenge with the use of a pharmaceutical metal detoxification agent such as EDTA, DMSA or DMPS. These compounds function by sequestering "hidden" metals from deep tissue stores and mobilizing the metals to the kidneys for excretion in the urine. Easy to follow instruction, and lab results came in quickly. Staff was organized and followed up with everything.